Jermain Taylor of Little Rock, Ark., celebrates his victory over Kassim Ouma of Kampala, Uganda, after their WBC Middleweight Championship fight at the Alltel Arena Dec. 9, 2006, in Little Rock. 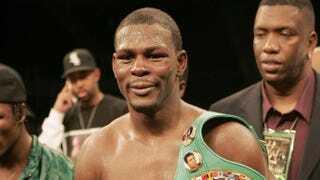 Middleweight boxer Jermain Taylor was arrested at a Martin Luther King Jr. parade in Little Rock, Ark., Monday after he allegedly put a gun to a man’s head and threatened to shoot, the Associated Press reports. During the parade, Taylor reportedly wielded his championship belt for everyone to see and then knelt down to give it to a 5-year-old boy. That’s when Taylor “almost fell over,” Toya Smith, the boy’s mother, explained, because the boxer was reportedly intoxicated. Smith said Taylor blamed her son for dropping the championship belt. “He bent down to give my son the belt and he almost fell over and dropped the belt, and he thought my baby dropped the belt,” Smith said. Smith says Taylor then took out a gun, fired two shots in the air and then put the gun to Smith’s husband’s temple, threatening to shoot. “He put [the gun] up against his temple, I jumped in front of it and it went off up into the air,” Smith said, describing how the shot injured her husband’s ear. Smith explained that if she hadn’t “hit the gun” away from her husband’s face, she is certain that Taylor “was going to shoot” her husband and “kill him,” she told AP. Smith says that even when she and her family got in their car to leave, Taylor continued to point a gun at the vehicle. “He was pointing at the kids, so I jumped in front of him again and said, ‘Please don't shoot my kids,’” Smith said. Taylor was charged with “aggravated assault, endangering the welfare of a minor and drug possession,” AP reports. He was released from jail after posting a $50,000 bond.